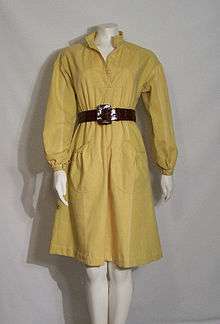 A vintage shirtdress, late 1960s-early 1970s. A 1950s vintage "shirtwaist" dress. 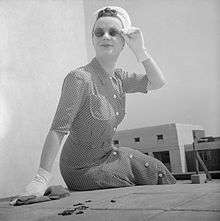 A shirtdress is a style of dress that borrows details from a man's shirt. These can include a collar, a button front, or cuffed sleeves. Often, these dresses are made up in crisp fabrics including cotton or silk, much like a men's dress shirt would be. As they are typically cut without a seam at the waist, these dresses often have a looser fit, usually relying on a belt to define the waist. Button fronts and a forgiving fit make this a flattering look for most body types. ↑ Hewitt, Valerie; Ann Kellogg & Lynn Payne (2008). The Greenwood Encyclopedia of Clothing Through American History, 1900 to the Present: Volume 1, 1900–1949. Greenwood Publishing Group. p. 311. ISBN 978-0-313-33395-8. ↑ "Fashion: A Spree on 7th Avenue". Life. 42 (10). 11 Mar 1957. p. 112. ISSN 0024-3019.